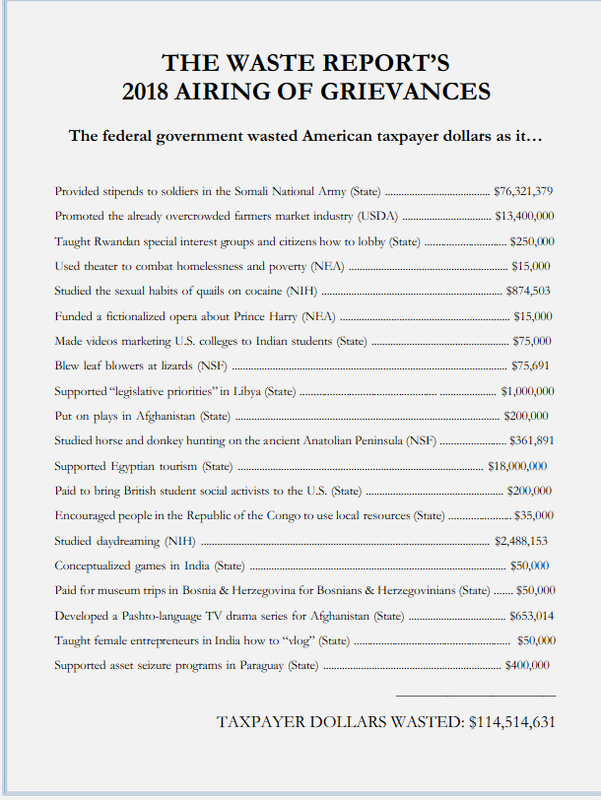 The Festivus Report deals with government waste. The report can be found here. I truly think we can do much better. We have problems at home that are not being addressed because of the large amounts of money we spend overseas for questionable purposes. It is time to take care of the people in our own country first. The Washington Examiner posted an article today stating that Rand Paul will vote for the Senate version of the tax reform bill. He stated that it is not a perfect bill, but has improved as it has been written. A handful of other Republican senators have expressed hesitance about the bill. One, Ron Johnson of Wisconsin, has said he is against it but that he is working with leaders and the Trump administration to change the legislation. Republicans are expected to amend the bill to get buy-in from cautious party members. One key to winning over Paul was including repeal of the Obamacare individual mandate in the bill. 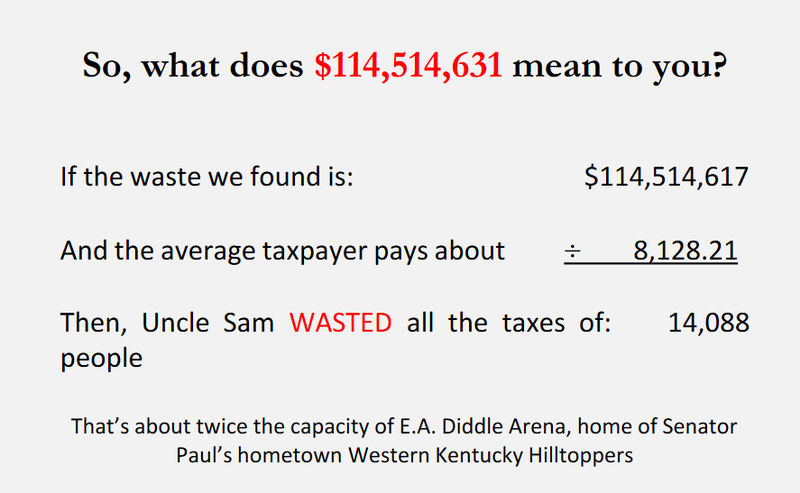 Paul wrote Monday that he would have preferred bigger tax cuts for individuals, and for the individual tax changes to be permanent rather than temporary as they are written to be in the current legislation. He added that some of the shortcomings of the bill could be fixed in future legislation. I would like to mention that it is wonderful that Senator Paul has recovered sufficiently from his injuries to return to Washington. Yesterday CSC Media Group, a conservative website, posted an article about S.222, a bill introduced in the U.S. Senate by Senator Rand Paul. The bill, called the ObamaCare Replacement Act, would repeal and replace ObamaCare. Currently the bill has been referred to the Committee on Finance. The bill is four pages long. The summary of the bill is not yet posted at Thomas.gov, but you can go to Thomas.gov and put in S.222 and read the entire bill. You can also follow the link to the website above and read the bill. Rand Paul is a doctor who practiced medicine for more than ten years before becoming a Senator. I believe he understands the problems involved in health insurance better than most senators. Among other things, his plan allows doctors to treat patients who cannot pay and take a limited tax deduction for providing the services. I think that is a wonderful idea. This is a healthcare plan I can support. The Hill reported Tuesday that Representative Justin Amash has endorsed Ted Cruz. Representative Amash previously supported Rand Paul. “It’s easy to withdraw from politics when the positions and priorities of the candidates do not precisely mirror our own,” Amash wrote in an op-ed published by the Independent Journal. “But we owe it to our beliefs to find constitutional conservative political allies who not only respect our philosophy but also fight for our views to be heard,” he added. America needs to get back to the Constitution. Ted Cruz is the candidate who can take us there. If we do not return to the structure of the Constitution, our government will disintegrate into a group of crony capitalist elitists who have total disregard for the wishes and general welfare of the American people. We may already be there, but Ted Cruz would be the President with the best chance of leading us out. This video was posted on YouTube last night. Protecting Social Security from the Thieves in the Night This is how it happens. Last night while you were sleeping the Senate voted to steal $150 billion dollars from the Social Security Trust Fund. I joined 34 of my colleagues in a vote to prevent this raid. I would like to thank Senator Rand Paul for leading the fight to protect to Social Security from the thieves in Washington, who seem to think that if they steal from the American people at night while they are sleeping that they will get away with it. I was proud to vote with Senator Paul on his point of order that would have protected Social Security, and I ask you to help me shine a light on what Washington has tried to hide from you in the darkness of night. If everyone who sees this message shares it, it will reach millions of Americans. As someone who has been fighting for years to reform our broken government in Washington, I know it is exhausting, I sympathize with your frustration, and I understand your impatience. But don’t give up. Washington wants you to give up. Just remember, a vote to raid social security in the middle of the night in a desperate attempt to perpetuate an unsustainable spending addiction isn’t a sign of strength. It is a sign of weakness. Late last night The Weekly Standard posted an article about the Republican Debate last night. The debate on CNBC was a tutorial on media bias. The questions were ridiculous, and the candidates called out the moderators on the silliness. The three winners of the night were pretty obvious: Marco Rubio, Ted Cruz, and Donald Trump. Rubio ended Jeb Bush’s campaign with the kind of body shot that buckles your knees. That’s on Bush, who never should have come after Rubio in that spot for a host of strategic and tactical reasons. But what should scare Hillary Clinton is how effortless Rubio is even with throwaway lines, like “I’m against anything that’s bad for my mother.” Most people have no idea how fearsome raw political talent can be. Clinton does know because she’s seen it up close. She sleeps next to it for a contractually-obligated 18 nights per year. Cruz was tough and canny—no surprise there. He went the full-Gingrich in his assault on CNBC’s ridiculous moderators. He did a better job explaining Social Security reform than Chris Christie, even (which is no mean feat). And managed to look downright personable compared with John Harwood, whose incompetence was matched only by his unpleasantness. If you’re a conservative voter looking for someone who is going to fight for your values, Cruz must have looked awfully attractive. Then there was Trump. Over the last few weeks, Trump has gotten better on the stump. Well, don’t look now, but he’s getting better at debates, too. Trump was reasonably disciplined. He kept his agro to a medium-high level. And his situational awareness is getting keener, too. Note how he backed John Kasich into such a bad corner on Lehman Brothers that he protested, “I was a banker, and I was proud of it!” When that’s your answer, you’ve lost the exchange. Even at a Republican debate. And Trump had a hammer close: “Our country doesn’t win anymore. We used to win. We don’t anymore.” I remain convinced that this line (along with his hardliner on immigration) is the core of Trump’s appeal. But he didn’t just restate this theme in his closing argument. He used it to: (1) beat up CNBC; and (2) argue that his man-handling of these media twits is an example of what he’ll do as president. It was brilliant political theater. I am not a Trump supporter, but I am supporter of the way he handles the press–he doesn’t back down. He’s not afraid of calling them out when they lie. The article at The Weekly Standard regards the six candidates with an actual shot at winning the nomination as Trump, Carson, Rubio, Cruz, and possibly Fiorina and Christie. I think they are on to something. I will say that whoever wins the nomination will have some really smart potential cabinet members to choose from. TEA Party Constitutional Caucuses were held in 9 locations in North Carolina today, and the results are in. In the Presidential Caucus, a total of 789 votes were cast across the state. Ted Cruz was the clear winner with 391 votes. This means that Ted Cruz took 50.13% of the vote. Since there was no limit on how many presidential candidates that could be nominated (so long as each was seconded), this was an impressive showing. Ben Carson got 328 votes, or 42.05%. Another impressive showing, but Ted Cruz was the clear winner with more than 50%. Constitutional conservatives in North Carolina who so choose can vote for Ted Cruz in the primary knowing their votes are likely to align with those of other Constitutional conservatives. They can thereby use the caucus results to counter the RNC’s “spliter” strategy designed to split the conservative vote and get Jeb Bush elected. Donald Trump got 31 votes, Rand Paul received 18, and Carly Fiorina got 6. Marco Rubio received 4 votes, and Bobby Jindal, 2. Ninety five people participated in the Caucus in the New Bern Location. Locally, Cruz got 41 votes, Carson got 39, Trump got 11, and Paul, 1. There were 3 people who abstained from voting. After a brief break in each location, the speeches, caucus, and voting process resumed. This time, the conservative choice for U.S. Senator from North Carolina was sought. Statewide, Larry Holmquist got 169 votes (58.28%). Dr. Greg Brannon got 106 votes (36.55%). U.S. Representative Mark Meadows got 13 votes (4.48%). Incumbent, Richard Burr, got 1 vote. In the New Bern location, Greg Brannon received 29 votes, Mark Meadows got 13, and Larry Holmquist, 2. Anecdotally, there was much conversation during the caucus period questioning whether Greg Brannon can be talked into running, and whether it might not be better to keep Mark Meadows where he is for now. I am a football fan. One of the great things about football is that when you turn on a football game, you see a football game. It is played like a football game and reported like a football game. Last night I turned on the Republican debate. I am not exactly sure what I saw. I am a Hugh Hewitt fan. He was there, sitting in a special chair. I believe he had less talking time than most of the candidates. I guess that’s okay–the candidates were the ones having the debate, but why was he there? Also, why was the debate reported as if it were a football game. It’s not a football game–it’s supposed to be a serious discussion to help voters determine who they want to run for President. Or is it? Now I am going into some tall grass. In August, The Conservative Treehouse posted an article about the establishment Republican’s strategy to make sure Jeb Bush was the party’s nominee. Basically, the strategy was to split the conservative vote in every early primary state so that Jeb Bush would win, even without a plurality of votes. If you look at the candidates, the theory cannot easily be dismissed. Marco Rubio will take Florida, Ted Cruz will take Texas, Lindsey Graham will take South Carolina, etc. Therefore, by the time you get to the more liberal Republican states, no conservative will have enough votes to challenge Jeb Bush. Any state, other than the four exempt states already mentioned, that holds a Primary the first two weeks of the month will be forced to allocate those delegate on a proportional basis. This means that if 5, or even 15, candidates are on the ballot, each candidate will receive a percentage of our delegates commensurate with the percentage of the vote they receive.This may sounds like a fair process on the surface, but as usual, there is more to the story. The RNC’s penalty will mean that a number of very conservative states,with high delegate counts like Texas, Virginia, and North Carolina, that intend to hold early Primaries, will be forced to divide their delegates among multiple candidates. In fact, 10 of 15 Southern states plan to hold their Primaries in this window. Conservative stalwarts like Colorado and Utah also plan to hold Primaries in this window. It is highly unlikely any candidate will emerge from these conservative states with enough delegates to establish a significant lead or gain momentum in the race to be the Republican nominee before March 14. The purpose of the debate (in the mind of the establishment GOP) is to divide the support among the conservative candidates. The media tends liberal, so they are going to play along so that the Republicans put forth a weak candidate. Unless the conservatives running for President agree among themselves on who gets out of the race and who remains in the race, we are going to have Jeb Bush as a candidate. I can assure you his candidacy will result in a Democrat President. The success of Donald Trump has thrown a bit of a wrench into the establishment plan, but I seriously doubt that a majority of Americans support a Trump presidency. There are some good conservative Republican candidates. If nothing else, the assembled people on the state would make an amazing Presidential cabinet. The problem is finding a conservative leader. I am sure Jeb Bush is an intelligent and very nice man–I just don’t want to see him as the Republican candidate–I don’t think he can win. On Thursday the National Review posted an article about members of Congress’s fraudulent application to the District of Columbia’s health exchange. This application facilitated Congress’s “exemption” from ObamaCare, allowing lawmakers and staffers to keep their employer subsidies. This is infuriating. The Small Business Committee chairman David Vitter needed a green light from the committee to subpoena the unredacted application from the District of Columbia health exchange. Five Republicans voted against that subpoena, as well as all of the Democrats on the Committee. The five Republicans were Rand Paul, Mike Enzi, James Risch, Kelly Ayotte, and Deb Fischer. In essence all of the Democrats on the Committee, as well as the five Republicans, were supporting ObamaCare fraud. I am amazed and dismayed at the lack of integrity in our elected officials. The American voters can do better than this. It’s fun to gripe about the left wing media. If the left wing media were not so skewed, there would be no need for the right wing media (or bloggers like me). However, when you look at some of the left wing media stories individually and realize some people depend on the left wing media for their sole source of news, you begin to worry. Breitbart.com posted a story today about three recent lies told by the mainstream media. The first story had to do with the National Rifle Association‘s Convention rules that seek to comply with the laws of the convention venue. Breitbart News previously reported that concealed carry is allowed at the NRA convention everywhere that concealed is allowed by state law and local policy. This means concealed carry-loaded handguns are allowed in the Music City Center but not at events in Bridgestone arena. The ban on concealed carry in Bridgestone arena is not an NRA ban but a local policy. After all the N.R.A. propaganda about how ‘good guys with guns’ are needed to be on guard across American life, from elementary schools to workplaces, the weekend’s gathering of disarmed conventioneers seems the ultimate in hypocrisy. Would the New York Times rather the N.R.A. ignore local and state regulations? The Times also found it hypocritical that the NRA requested its gun dealers to remove the firing pins from display guns that thousands of conventiongoers will have access to Apparently, the Times finds it just as bizarre when dealers remove the keys from automobiles at car shows and my local WalMart removes the video games from video game boxes. The second media lie involved Rand Paul, a candidate whom the Democrat party obviously sees as a threat. This lie came from The Guardian and Politico. The lie was that Rand Paul stormed out of an interview and shut out the lights. The truth is rather different. Rand Paul explained to an interviewer from The Guardian that he only had time to answer one more question, which he did. He then left the set and the lights went out. CNN later admitted that they had turned out the lights–Rand Paul did not. However, the lie was already out. The third media lie came from Bloomberg. Someone at Bloomberg read at The National Report website (a satirical website) that Nancy Reagan had endorsed Hillary Clinton. Because the person did not know that it was a satirical website and did not check to see if it were true, they ran with the story. Eventually they retracted their lie. Obviously this is not quality reporting. It is a danger to our representative republic–the key to our freedom is informed voters. This sort of news coverage does not produce informed voters. There are a lot of news sources out there. Some are more reliable than others. I strongly suggest that any story coming from the mainstream media needs to be checked against another source. We can no longer trust the press to do its job. On Monday, The Wall Street Journal posted the text of the open letter that 47 Senators signed about negotiations with Iran. Second, the offices of our Constitution have different characteristics. For example, the president may serve only two 4-year terms, whereas senators may serve an unlimited number of 6-year terms. As applied today, for instance, President Obama will leave office in January 2017, while most of us will remain in office well beyond then — perhaps decades. Please read the letter carefully, and then draw your own conclusions as to whether the Senators were justified in sending it. Holly Robichaud posted a column in the Boston Herald today about the political landscape over the next two years. The GOP’s extensive field includes Sens. Ted Cruz of Texas and Rand Paul of Kentucky, and Govs. John Kasich of Ohio, Scott Walker of Wisconsin, Mike Pence of Indiana and Louisiana’s Bobby Jindal. While Cruz is no favorite of the D.C. establishment, his political backbone in working to stop the Obama agenda will be an advantage. Unlike Speaker John Boehner, Cruz embraces November’s message that Americans overwhelmingly reject Obama’s policies, including amnesty. Paul should be red hot due to his appeal to younger voters, but his foreign policy and amnesty positions will hold him back. Kasich, from a key electoral state, has served in Congress and been a Fox News host. As governor he created 45,000 new jobs and fixed an $8 billion budget deficit, and he’s someone to watch. The article also mentions the moderate Republican candidates–Jeb Bush, Chris Christie and Mitt Romney. If the number of conservative candidates split the conservative vote, one of these men could win the nomination. Incoming Senate Majority Leader Mitch McConnell will have to decide between being a Boehner clone — which will depress the GOP base vote in 2016 — and being a leader in fighting Obama’s destructive executive orders. If he chooses the latter, McConnell could play kingmaker in the primary. Most Democrats understand President Obama has moved the country too far to the left, except our U.S. Sen. Lizzy Warren, who thinks the whole world is the People’s Republic of Cambridge. Ultraliberals will continue to rally around her as the rest of Democrats try to go mainstream to save the party from extinction. If the conservative movement wants a presidential candidate in 2016, they are going to have to unite around one candidate, and during the next two years, they are going to have to show the country that they have workable ideas as to how to turn America back to the constitutional republic it was intended to be. I’m Convinced There Is Something In The Water In Washington, D.C.
Today the National Journal posted a story about the relationship between the Tea Party members in Congress and the Tea Party members trying to get elected to Congress. Sen. Marco Rubio of Florida won’t take sides in GOP incumbent primaries because of his own experience of running against the establishment’s pick. Neither will Sen. Mike Lee of Utah, who rode tea-party support to take down a three-term incumbent. Sens. Rand Paul of Kentucky and Ted Cruz of Texas are also unlikely to back any of the conservatives taking on Republican senators; in fact, Paul is committing heresy in the eyes of tea-party hard-liners by endorsing two Washington insiders, Kentucky Sen. Mitch McConnell and Wyoming Sen. Michael Enzi. This show of decorum from senators who instigated the unpopular government shutdown is striking at a time of mounting friction between the establishment and tea-party wings of the Republican Party. So what’s behind it? The upshot of the tea-party caucus’s largely staying on the sidelines—and, in Paul’s case, endorsing two of his colleagues—is that of all the protocols the conservative insurgency has trashed on Capitol Hill, a member endorsing a colleague’s opponent remains strictly taboo. Note to Republicans–it’s not a club–it’s a government, and right now it isn’t working very well. The Tea Party is a grass roots movement. It was started and has been joined by people who do not like business as usual in Washington. If Congressmen who are elected by the Tea Party become part of business as usual, they will be unelected. The Tea Party will gain strength as people feel the weight of government over-reach. Since the Tea Party is responsible for what life there is in the Republican party, the Republicans in Congress need to support Tea Party candidates when they are running against business as usual candidates. If The American Economy Is Recovering Why Do We Need To Extend Unemployment Benefits? I am not unsympathetic to people who have lost their jobs during the recession. I know that there are a lot of them. I don’t mind paying unemployment benefits to people while they look for jobs. I just don’t understand why unemployment benefits should be paid to people for almost two years. I don’t think that encourages people to look for jobs. The Wall Street Journal posted an editorial today about the economic impact of extended unemployment benefits. The article reminds us that according to the current unemployment numbers, the unemployment rate is 7 percent–not 10 percent rate as it was when the extension of benefits was originally passed. This also ignores that states and employers are already paying for this supposed free lunch in the form of higher job-killing payroll taxes under the Federal Unemployment Tax Act, or Futa. At least 24 states have been forced to raise this tax since 2010 and the Labor Department says it will rise again in 13 states to repay $20 billion in loans and interest they owe the feds for helping to finance state-funded benefits. This federal tax is applied to 0.6% of a worker’s first $7,000 of annual wages. The rate rises automatically by 0.3% for every year states fail to repay their unemployment insurance loans from Uncle Sam. …Economist Martin Feldstein long ago proposed a better plan to create a self-insurance component of unemployment insurance with tax dollars going into an employee trust fund for each worker that could be drawn during a bout of unemployment. Workers could keep whatever money was left over at retirement, which would encourage workers to become re-employed more quickly after losing a job. Instead the current system provides as much as two years of benefits for not working and raises payroll taxes on employers even as some 20 million Americans are still unemployed, underemployed or discouraged from looking for work. None of this will help the economy create more jobs, which is what the jobless need far more than another government check. The American taxpayer cannot afford to pay people not to work for extended periods of time. We are in danger of losing our work ethic. There was a time in this country when a person would take any job available rather than take money from the government. Unfortunately, we have come a long way from that time. Unemployment benefits should be paid for a long enough time period to allow a person to find a job. Two years is simply too long to pay a person for not working. The video appeared at The Blaze. If you want to know where the power is in Washington, watch the statements of the people who may be facing tough re-election campaigns. One of these people right now is Senator Mitch McConnell, who is faced with a celebrity opponent at a time when his own popularity is fading. Generally speaking, Mitch McConnell represents the establishment Republican party, but the establishment is being strongly challenged these days. Yesterday was a really bad day for the establishment–Rand Paul held a filibuster and discussed an issue that concerns many Americans. Today’s Washington Examiner is reporting that Senator McConnell praised Senator Paul‘s actions and referred to the dinner with the President attended by some Republicans as a publicity stunt. Do you believe that Senator McConnell would have said anything at all were he not involved in a very difficult election next year? The fact that he is right is purely coincidental. He said Obama probably reached out to Republicans to help stem his plummet in the polls. “I think his effort so far to try to scare everybody and and try to convince the public that the sky is falling because we’re going to cut federal spending 2.4 percent out of $3.6 trillion out of the next six months has been a failure. So he may feel that just trying to rub our noses in it all the time is not going to work for him,” he said, citing the president’s seven-point drop in the Gallup approval rating in just one week. Senator McConnell is courting the Tea Party in order to win reelection. If there is a conservative primary challenge to him, the Republicans stand a chance of losing the seat. If there is not a primary challenge and he wins, we still have the same stale leadership. The definition of insanity is doing the same thing over and over again and expecting different results. It’s time that those of us in the Republican Party who want change thought about that definition.